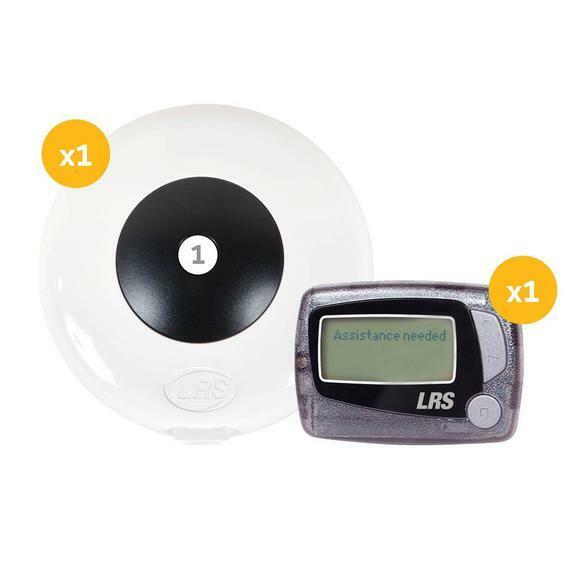 The LRS Pronto one-button paging system gives customers or staff the ability to request assistance from someone on-site immediately. With the touch of a button, a silent page is delivered to anyone in your building wearing an LRS messaging pager. The Pronto single-button paging system includes one LRS wireless Pronto transmitter and one battery-operated LRS messaging pager that features a display screen that can receive text messages with up to 200 alpha or numeric characters. Includes your choice of up to 20 pagers. The LRS Pronto is the ideal solution for smaller offices of 2,500 square feet or less, such as medical offices needing to page staff when assistance is needed in exam rooms, or any situation where a staff member is on-call to help customers or others at a moment's notice. The Pronto transmitter can be placed on a desktop, wall-mounted, or even hidden under a counter to discreetly send notifications. Includes: (1) Pronto One-Button Transmitter (TX-PRONTO-1PS), (1) Alphanumeric Staff Messaging Pagers numbered 1 (RX-E467). Device pre programmed to your exact needs. Great support, 1-year warranty on all parts, additional pagers and parts sold separately.